ASCAP changed their reporting of Top 25 Holiday Songs to only the Top 10 in 2012. In their press release you'll note that Here Comes Santa Claus (Right Down Santa Claus Lane) and Rudolph, the Red-Nosed Reindeer performed by Gene Autry – or anyone else – did not make the top ten list. Johnny Marks, the composer of Rudolph, did make the list at number four with Brenda Lee's performance of his song Rockin' Round the Christmas Tree. New York, NY, December 16, 2013: The temperatures have dropped, stores are abuzz with shoppers trying to find that perfect gift and the joyous sounds of perennial holiday classics fill the air. Yes, it's that time of year again – the most wonderful time of year. And once again, the top ten most-played holiday songs this season were all written or co-written by members of the American Society of Composers, Authors and Publishers (ASCAP). This year, “Let It Snow! Let It Snow! 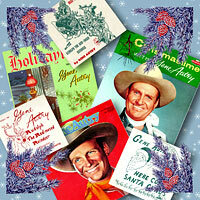 Let It Snow!,” written by Sammy Cahn and Jule Styne, tops this list of holiday standards. Since November 1st, 2013, “Let It Snow! Let It Snow! Let It Snow!” has aired more times than any other holiday song this season, ending the four-year reign of previous list-topper “Sleigh Ride.” The holiday favorite was written by lyricist Sammy Cahn and composer Jule Styne in Hollywood, CA in July 1945 on what was the hottest day of the year. A song about making the most of a snowy day by spending it with a loved one by the fire, it was first recorded by Vaughn Monroe and has since become a holiday standard. And as is the case with many holiday standards, “Let It Snow! Let It Snow! Let It Snow!” continues to be re-recorded by contemporary artists year after year. Most recently, covers by ASCAP members Jewel (2013), Rod Stewart (2012), Glee's Darren Criss (2011) and Lady Antebellum (2010) have boosted already impressive airplay. Though Dean Martin's version is the most popular, countless other covers of the tune have been recorded by a wide range of artists, including Frank Sinatra, Herb Alpert, Carly Simon, Michael Bublé, Andy Williams and Boyz II Men. 3. "It's Beginning to Look a Lot Like Christmas"
4. "Rockin' Around the Christmas Tree"
7. "It's the Most Wonderful Time of the Year"
8. "Do You Hear What I Hear?" 10. "Santa Claus Is Coming to Town"
Also noteworthy from this year's radio holiday charts was that both Kelly Clarkson's “Underneath the Tree,” written by Kelly Clarkson and Greg Kurstin, and Mary J. Blige's “This Christmas,” written by Donny Hathaway and Nadine McKinnor, took the #1 and #2 spots, respectively, of holiday songs added to radio in 2013. Note: The top ten list above represents an aggregation of all different artist versions of each cited holiday song played on radio from 11/1/13 through 12/11/13. The holiday song data was tracked by radio airplay monitoring service, Mediabase.